Just yesterday we introduced TidyTilt+ iPhone 5 case. If you want to attach your iPhone 5 with the case or other metal small gadgets on the wall, their JustMount wall organizer should be a nice solution. 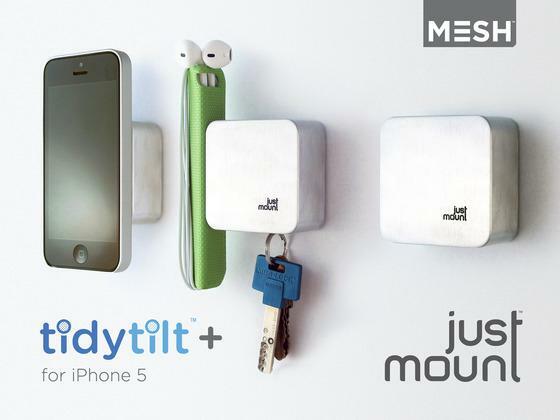 JustMount is a practical wall mount system designed for TidyTilt+ iPhone 5 case and other metal items. As we can see from the images, the wall organizer features smooth, elegant design, using two rear custom cutouts, you can easily attach JustMount on your wall, while the magnetic surface allows to hold your iPhone 5 with TidyTilt+ protective case in portrait or landscape viewing mode for hands-free video calls. Of course, in addition to your iPhone 5, the wall mount system is also able to keep other metal items in place such as Lightning cable, pens, scissors, kitchen gear and more.